LMAO!!! I love the ending scene. Especially the Jek Porkins and Leia! LOL!! Good job. Too bad its ending though. 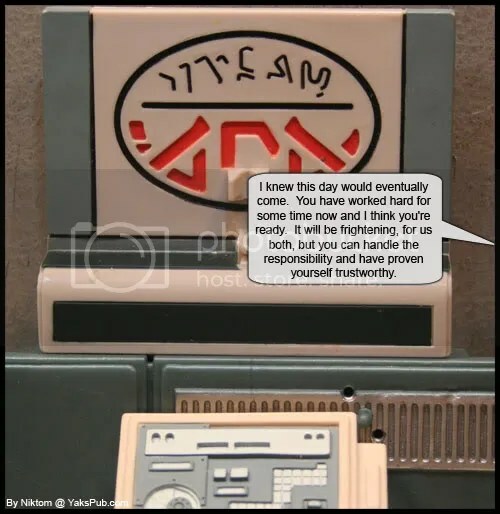 The four signs of the impending Yak’s Pub apocalypse: Wicket’s riding a Gonk, Angry Luke’s getting a Wokling drunk, Mork from Ork is the designated driver, and Palpatine shows up cradling the remains of Darth Plagueis the Wise. Is WIcket holding a bottle from the McFarlane Bob & Doug McKenzie figures? I thought that cooler in the back of the golf cart the other day looked familiar. Yep, those are complements of Bob and Doug. I don’t actually have the figures, picked up the majority of their accessories in an Ebay lot. I need to Netflix that movie… been waaaay too long. 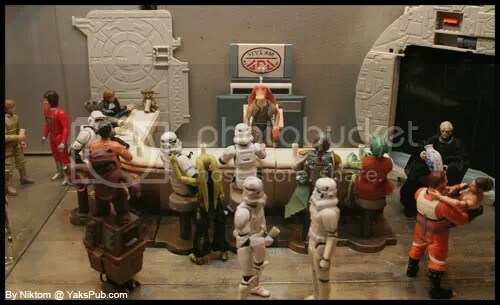 if the whole “Yak’s Pub is ending” thing was just a big tease that Yak’s Pub is into Jar Jar’s Pub, than it was something I never would have seen coming. But, I know it’s not true. I don’t think this is his first utterance… but I can’t tell you precisely when it’s occurred before. Niktom? Nope, he has actually spoken a few times before. The first was on the “800th Strip”. A second time in “Shake It Up“. There maybe a third… LOL, someone with a better memory on my comics is going to have to verify this one. I think next comes locusts, then the plague….. This is great. So much going on it’s hard to comment on it all. I think Alex summed it up well though. 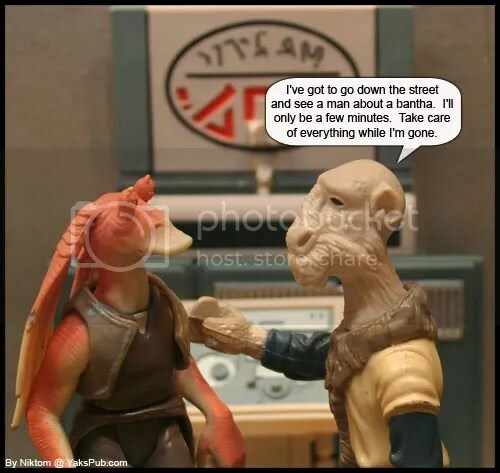 If this strip ends in June and sticks to it’s MWF schedule, then we have two more strips to see how Jarjar brings about Yak Pub’s destruction. Can’t wait.